Cheeky rose to fame during something of a late 1970s renaissance in British comics. Ground-breaking titles Action (1976-77) and 2000AD (1977 - present) are often cited as revivifying forces in what had become a somewhat staid comics scene, but there were equally mould-breaking humour titles appearing in the shops during the same period. 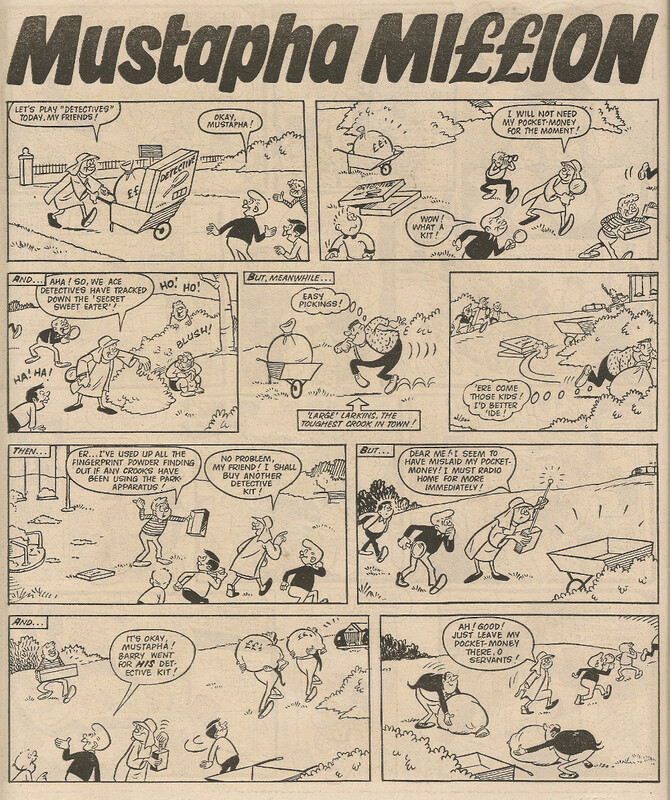 The free-wheeling, madcap Krazy made its debut with an issue cover dated 16 October 1976. 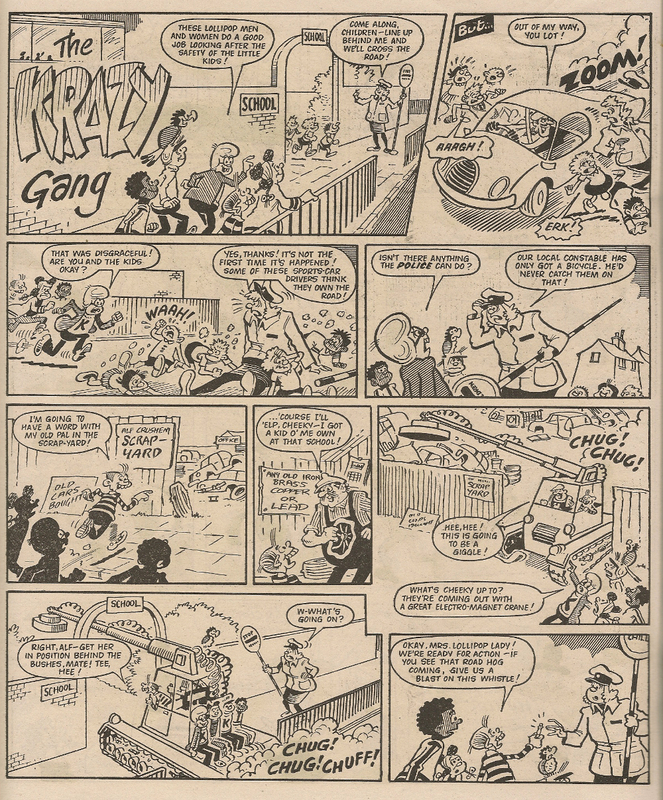 The toothy funster, who first appeared in that premiere edition, was pushing the envelope of comic convention from the start, featuring in 2 strips in Krazy every week – as a member of The Krazy Gang and also as the star of his own four-page strip 'Ello, It's Cheeky (later retitled 'Ello I'm Cheeky). Just a year later, Cheeky's career ascended to another level as his very own comic, the innovative Cheeky Weekly – in which he featured throughout - hit the newsagents. For a golden period of 26 weeks, comic readers could immerse themselves in Cheeky's gag-cracking world across two titles. These glory days couldn't last forever, and it seems Krazy's unconventional style was not to everyone's taste, as that comic folded in April 1978. Following its demise, however, some of Krazy's features were assimilated into one of IPC's flagship titles, Whizzer and Chips. Among the Krazy survivors moving into the pages of that venerable comic were The Krazy Gang, still featuring our grinning pal as a member of the titular group. Thus, despite the foundering of the comic that spawned him, fans of Cheeky continued to enjoy the grinning gagster in 2 comics each week because, undeterred by the fate of its progenitor title, Cheeky Weekly continued publication. Sadly, the vicissitudes of the comics business were too much for even our toothy pal to withstand, and his own title just made it into the new decade before coming to an end with the issue dated 02 February 1980. The 'merge' that inevitably resulted from the wreck of Cheeky's comic saw survivors from Cheeky Weekly scramble aboard another IPC stalwart, Whoopee! Somebody at IPC (possibly Bob Paynter, Group Editor of the IPC humour titles) clearly had a soft spot for our grinning chum, as Cheeky was allocated his own comic section at the centre of Whoopee!, into which the refugees from his former title settled, and within which Cheeky himself was given a whopping 4-page strip in which to carry on jesting. Despite this change in Cheeky's fortunes, loyal fans were still able to buy 2 comics (Whizzer and Chips and Whoopee!) featuring the mighty-molared mirthster. Cheeky continued to appear on 4 Whoopee! 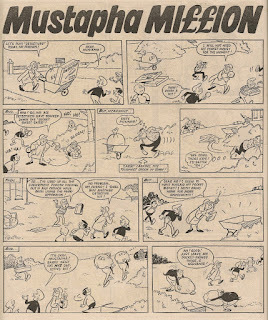 pages per issue until the title underwent a revamp commencing in the edition dated 12 September 1981, from which date Cheeky was reduced to 2 pages a week (although, ever the iconoclast, the grinning gagster appeared in multiple strips across those pages, sharing space with a strip devoted to his slimy sidekick, Snail). From 1982, Cheeky suffered a further demotion that cut his strip to just a single Whoopee! page per week. Sadly, this was not be be the final indignity for a comic superstar who once had an entire comic devoted to his weekly adventures – as from Whoopee dated 02 July 1983 (the date of Whoopee's absorption of Wow! and the point at which the host comic lost its exclamation mark), Cheeky was relegated to the Quick Strips page where his presence in the comic was reduced to a single row of panels among 3 other strips (one of which featured his erstwhile Cheeky Weekly colleague Paddywack). Notwithstanding the ignominy, Cheeky was still able to boast weekly appearances in both Whizzer and Chips and Whoopee. As the economic realities of the 1980s took hold, further upheavals in the comics industry were inevitable. Whoopee's final issue hit the newsagents five years after it absorbed Cheeky Weekly. As the British comics business contracted, there were fewer available titles into which defunct comics could be merged. Andy Boal's highly enlightening comment here gives an overview of how Fleetway/IPC's merges were allocated from the early 70s. IPC management decided that Whoopee would merge into Whizzer and Chips. Sadly Cheeky, in his incarnation stretching back to the 'Ello, It's Cheeky strip in Krazy, did not survive this latest merge. 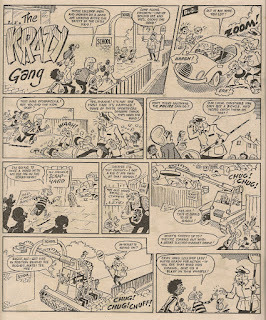 However, The Krazy Gang, whose genesis also reached back to the origins of Krazy but via a diverging route, were among the strips that were retained in Whizzer and Chips. 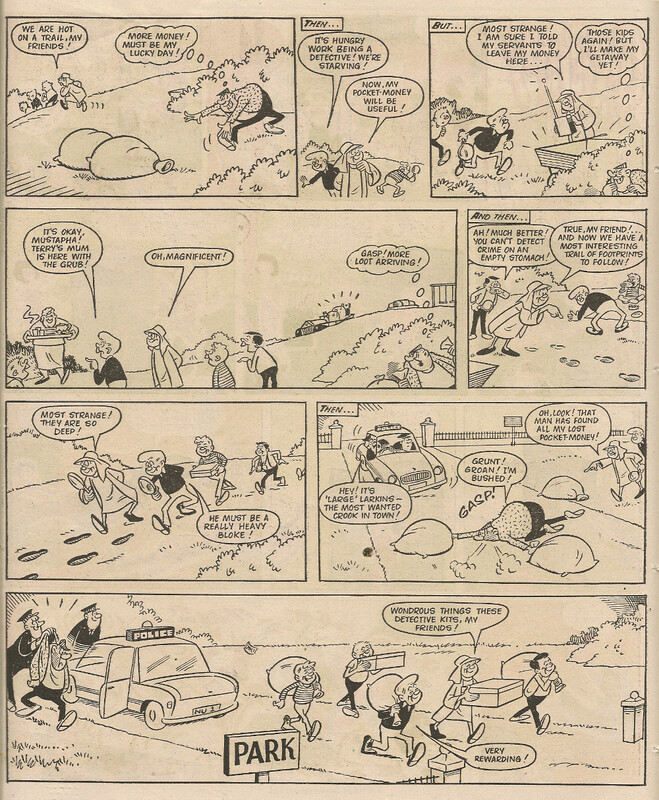 Thus, the week of the first combined issue of Whizzer and Chips and Whoopee (cover dated 07 April 1985) was the first since October 1977 in which Cheeky had a regular strip in only one comic. This 7 year run of concurrent appearances by the same character in 2 comics (although not the same comics for the entirety of the run) must surely be some kind of record. 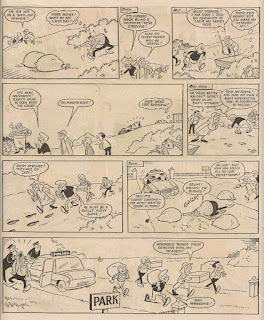 Cheeky, resolute in the face of this reversal of fortune, continued to play his part as a Krazy Gang team member until that strip came to an end in Whizzer and Chips dated 08 February 1986 (bringing this post back to where it started). Thus ended, with no ceremony, Cheeky's nine and a half year presence in weekly British comics. In that same issue, Mustapha Million suffered a pesky Whizz-kid interloper. Can you spot the gatecrasher? Buuuut .... that wasn't quite the end of the influence of the toothy funster's comic, since Mustapha Million and Calculator Kid continued to appear in Whizzer and Chips beyond the demise of The Krazy Gang. OK, let's get this somewhat circuitous Whizzer and Chips Raids post back on track and do the admin. This would appear to be a revenge raid by Animalad on Mustapha, who had previously invaded the rather insipid, animal-morphing character in the 05 October 1985 edition (link in table below). At this stage our ex-Cheeky Weeky chums had been raided on 14 occasions, having perpetrated 8 incursions on those pesky Whizz-kids. We can only imagine what the effect of losing Cheeky in his guise as a Krazy Gang member will have on the future tally of raids. I have to admit, it's not looking good. Thanks for the link Andy. If I may be so bold, I see you're still referring to Bob Hill as Gordon! That was my fault. I'll fix that up shortly. Town Tarzan was good though..
At least Town Tarzan wasn't as bad as Animalad! A great and thorough feature where you've almost had to distinguish between completely different characters; the Krazy Gang seemed uprooted from their eponymous town and Freaky's surreptitious editing-out before the 80s were underway left the strip way too sane! Yep, Cheeky certainly had an interesting, non-linear comics career. And what DID happen to freaky? Great News - It's Cheeky!